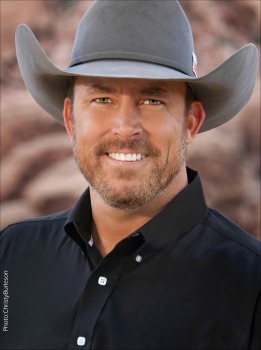 Chad Prather used his social media mojo to build his brand. Now, he's got SJWs in his sights. 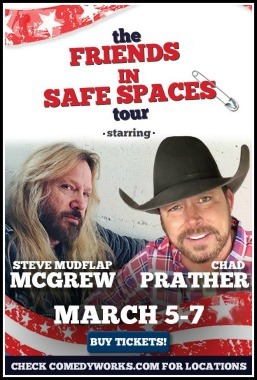 Chad Prather is about to enter the most controversial zone in America today – the safe space. 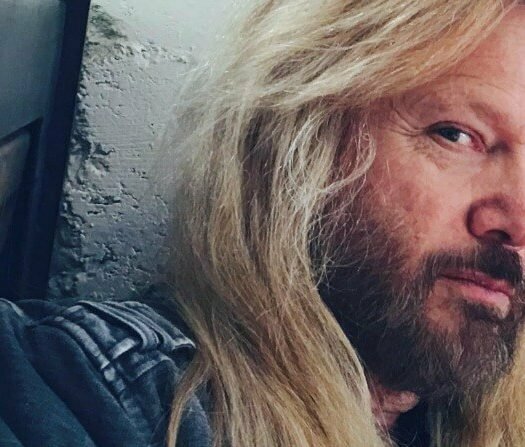 Prather, dubbed the “Pickup Truck Pundit” by CNN, is teaming with comedian Steve McGrew for a new comedy act debuting in Denver March 5-7. Introducing the Friends in Safe Spaces Tour. That means Trump protesters will get what’s coming to them. Just don’t expect an expletive-filled attack from Prather and McGrew, the kind you hear too often from liberal firebrands like Samantha Bee. Unhinged leftists may be fine comic fodder, but Prather knows they represent a small fraction of the country he proudly calls home. In fact, he often spars with pals who don’t share his politics. And those debates don’t end with hurt feelings … or worse. Prather isn’t a conventional stand-up comic. The Denver gig represents his first time in a comedy club setting. He’s more of a storyteller, and he’s been selling out theaters for some time now spinning yarns. Before hitting the national stage, he was living the American dream … on paper. “I was miserable but successful,” he says. The Texas resident’s corporate gig paid the bills, and then some. Yet something gnawed at Prather all the same. So he quit, telling his wife he planned to make his personality his career. “What’s the street value in your personality these days,” she asked him. Good question. Turns out it was higher than even he expected. He quickly found some TV work and started uploading his comic ramblings on YouTube. He hoped the videos would stoke interest in his TV work. It did something else. It made him a new media celebrity. One clip in particular, “Unapologetically Southern,” went viral. His full-throated defense of the southern lifestyle cemented his online persona. So his pairing with McGrew, the self-described “hell bent Southern gent,” makes sense. “I was in Las Vegas two Decembers ago, walking down a long hotel corridor behind two beautiful blondes. One of them turned around, and it was Steve McGrew,” Prather says with a laugh. They already knew each other’s work. A bond quickly formed. “He and I always said, ‘let’s put something together, I don’t know what,’” he says. McGrew had already booked his time with Denver’s ComedyWorks and invited Prather to join him. But what would they call the act? Listen to “HiT Episode 38 Chad Prather” on Spreaker. Prather isn’t a comedian by trade. Nor has he suffered what 99 percent of stand-ups endure early in their careers. That flop sweat moment. So far, the mainstream press isn’t mistreating him despite his conservative leanings. I don’t know why we can’t just go out and poke fun at the extremes. Prather has social media to thank for his career ascent. That doesn’t mean he’s comfortable with new media. Humans have always been storytellers, even if it meant scrawling pictures on the inside of a cave, he says. Those poets, and artists, took care and pride with their prose over the years. “Now, everyone has a voice and not everyone is responsible to handle that voice,” he says. He wants more people to take care with the material they tweet or post. “Let’s do it in love and humorously with a smile, with a hug and embrace,” says Prather, the mind behind the popular “Protesting the Protesters” video rant. That doesn’t mean the venom coursing through social media will end anytime soon. “There’s a sadistic mind set [with some users]. They enjoy getting a rise out of people. I don’t know if we’ll get away from that troll mentality,” he says. Prather’s YouTube fame began organically. “I was just riffing off the cuff. I started thinking about something, and I’d pull over and start recording,” he says. Now, Prather gives his YouTube commentaries more planning before hitting record. From there, it’s usually two or three run throughs and it’s time to publish. Why not just a single take? He wants to make sure the message – and tone – are just right. “That strategic smile takes the pressure off a controversial statement. Do I look too pissed off when I said that?” he asks.